Geology is full of strange mysteries, from towering structures to small formations. The more we examine these deceptively complicated phenomena, the less we understand their origins and the processes that created them. Here are 10 geological forms that we still don't understand, even after years of careful study. The science of geomorphology — the study of landforms and the processes that create them — is one of the most intuitively simple sciences at first glance. Working from the premise that the basic physical processes shaping our planet now are the same as the processes that shaped it in the past, we can extrapolate that such concepts as the harsh sun drying out wet minerals after carving soft rocks, and air depositing wind-born dust, are responsible for creating the landscapes we see around us. Some concepts, like the transition from an island volcano to a beautiful atoll or the differential erosion of circular anticlines, wind up making sense. Canyons seem so unbelievably straightforward: rivers incise bedrock, carving channels as they cut deeply into the rock, until a steep-sided valley remains. Over enough time, rivers can erode deep canyons into the landscape. The only problem? It looks like wind has far more impact than we ever imagined. By looking at canyons in the same region with the exact same rocks where the only difference is if they're sheltered from the wind or fully exposed, researchers recently found that wind can increase canyon growth rates by 10 times as much! Who even knows how much of an effect it has on a place like Mars, where the winds are relentless and water is but a distant memory? If we've been missing a fundamental chunk of how canyons grow for decades, how much are we misunderstanding about other "easy" landforms? Patterned ground is exactly what it sounds like: when the ground has patterns of stripes, circles, polygons, nets, or steps. The patterns can be extensive and long-lasting, texturing the ground through years of summer thaws and winter freezing. Patterned ground formation clearly involves some sort of cracking, sorting, and even slope movement, but beyond that? Mystery. Does the ground crack from freeze-thaw ice spears, or from thermal expansion and contraction, or from drying out and desiccating? Does it heave up from frost below the soil, shuffling large stones to the center of the heap while smaller stones slip downhill? Are they the surface expression of convective cells in the active layer of permafrost? What role does vegetation play? Mima mounds, also known as prairie pimples, are vast fields of oval, gravelly hills, standing 30 cm to nearly 3 meters tall. The hills can take 500 to 700 years to be created, and they can survive for thousands of years — yet we've never actually seen them form. They might be vegetated interior sand dunes, a structure created by seismic shaking during earthquakes, produced by shrinking and swelling clays — or any of a nearly countless-array of other theories. From computer models, pocket gophers seem capable of being the culprits, slowly pushing dirt uphill into mounds for no discernible reason, yet we've never caught a gopher in the act of mound-building. A lineament is any linear feature on any scale, from microscopic to scarring satellite imagery. So it seems downright reasonable for them to be a point of confusion, since they can be caused by many different things — faults, island arcs, and just about anything else that can cause cracks, stretching, scrapes, or stresses. The quest to find a global set of lineaments would be phenomenal for unravelling geologic history, but is hugely unlikely given our planet's constantly-shifting crust. In the meantime, they occupy a place somewhere between numerology and pareidolia, with scientists spotting them, hypothesizing frantically over what they are, reclassifying them into a different landform when they learn more about how that particular batch formed, and moving on to the next suspected lineaments. Drumlins are teardrop shaped hills that usually occur in clusters. They are one of the easiest landforms to identify, yet they're also totally mysterious — were they formed by erosion or deposits? They could be subglacial material carved by meltwater, slightly squishier saturated sediments moulded by the overlaying glacier, or deposited goop infilling any cavities on the underside of the glacier. While we have countless examples of drumlins that were formed in the last Ice Age, modern examples are more skimpy, so we have limited observations on the sneaky hills actually getting created, and just as little data to help us sort between competing theories. These offshore islands are a common sight on the East Coast, and they're excellent for protecting the coast from storm damage. But are they overgrown extensions of spits or bars fed by longshore drift? Or are they the remnants of a stranded coastline of dunes, storm ridges and berms, with rising sea levels flooding to create the lagoons separating the islands from the mainland? Or is it a combination, with a stranded coast providing the seed of stability for a growing island? In all likelihood, this is one of those "D. All of the above" moments, where the answer changes with the particular island. Pediments are exposed, gently-sloping bedrock surfaces with thin, temporary veneers of sediments. The pediments form along mountain ranges in arid environments, provided they aren't smothered by deep aprons of sediments from debris flows. They're so shallow, they can look almost flat under sediment rapidly dancing across the bare rock. The main theories for how they form are lateral corrasion, when river channels erode sideways as they downcut; sheet-flooding across the surface; some form of subsurface weathering that sheds the pediment in sheets; rill-wash from closely-spaced channels; or slope retreat and exposure of a bedrock bench. Each theory has its own flaws, when the observed processes don't seem to create the vast, near-flat surfaces, yet they're the best theories we have — so we're sticking with them until we come up with something better. 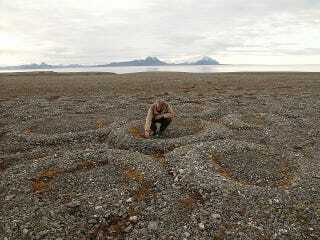 Bornhardt are large, circular domes formed by spherical sheets shedding off uplifted rock. They could be formed by long-distance scarp retreat in a series of piecemeal landslides, or a multi-stage process of weathering and stripping of loose rocks. Since they shed rocks in sheets, another question is if the weakened joints form by the rock expanding after unloading overlaying material, or is it the exact opposite and the joints formed under compression from being squeezed while buried? This coastal feature makes perfect sense, if you don't look too closely. While waves erode a cliff down into sand to feed nearby beaches, the most resistant rocks stay strong and upright. Over time, the coastline retreats, with caves cutting into the cliff, growing into a full tunnel to leave a rock bridge, and finally that bridge collapses into a channel to leave an isolated sea stack as a rocky island off the coast. Simple, logical, done. Yet, when we start looking at details, our pretty story falls apart. We don't really know how quickly these sea stacks form, or how much local influences like an influx of abrasive sand from pocket beaches or cracks in the rock have on sea stack formation, or why a particular sea stack forms from that particular piece of headland when the entire bluff is geologically similar. Feathered dunes are long, thin dunes with branching, "feathering" ends. They're so weird that we can't even reliably identify them — but theoretically, feathered dunes are a transitional dune between linear dunes created by prevailing winds from one direction and star dunes where wind direction frequently shifts. The problem? The only example we thought we had has been reclassified as something entirely different where the shape is attributed to sediments of different mineral composition and density, not wind regimes. Now we have a theory for a dune that should logically exist, yet no examples of it anywhere on Earth or even Mars. Even worse? We know that almost every aeolian feature between 10 cm and 10 m in scale relies on streamers of wind-blown sand, yet the challenges in actually tracking sand streamers thwarts getting solid data on the process in action. These are far from all the bizarre mysteries in geomorphology. Sometimes it feels like the more common a landform is, the more likely it is the processes that create it contain hidden complexity. Other times, it feels like each time we unravel one mystery, another pops up to be solved in turn. Any way you look at it, between the weird landforms on our planet and the even odder ones elsewhere around our solar system, we aren't going to run out of strange shapes to research any time soon.